In 1905, John Browning invented the 25 ACP. Designed to give a pistol the same power the 22 LR offers in a rifle, Mr. Browning invented a low recoil, high powered handgun round, albeit a very small one. 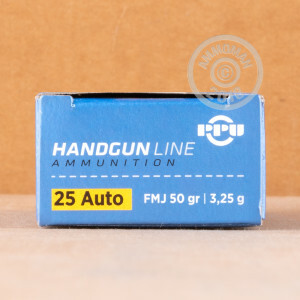 If you have weak hands or just want to plink around without having to deal with recoil or high ammo costs, the 25 ACP is the round for you. 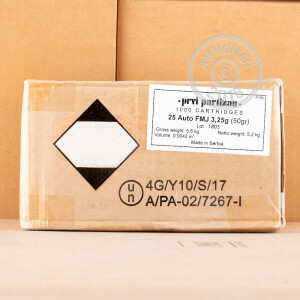 When you buy from Prvi Partizan, you are getting some of the best rounds of Eastern Europe. Providing more calibers than even some popular American manufacturers and offering high quality, non-corrosive ammunition, Prvi Partizan is leaps and bounds ahead of many of their Eastern European competitors. 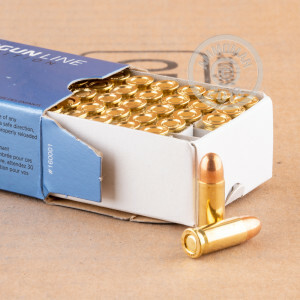 These 50 grain,k 25 ACP, full metal jacket rounds make for great range training ammunition. With their boxer primers and brass casings, these rounds are even reloadable, giving you even high value for this great ammunition.